← Face to Face with ModulesGarden! The favorite festivity of every bargain lover is finally upon us! If you were hoping to score some truly juicy deals this year, you have totally come to the right place. Watch out, the Black Friday craze kicks in with a bang in 3… 2… 1! Purchase any annual license before the end of 24th November, 2018 CET Time at a bumper 25% discount! To take advantage of our Black Friday promotion, you only need to put the below code in the appropriate box while placing an order on our website and a discounted invoice will be generated automatically. The offer cannot be applied to other product types than annual, but you can – and should! – spice it up even more by combining the promo code with other discounts generated automatically at the checkout. So pick up as many software items as you want, and just let the thought of all the extra money you save sink in! We cannot guarantee that such a splendid opportunity will present itself any time soon, but we do promise that buying your favorite modules ahead will feel real good. Fishing for a discount on the modules’ open source version? 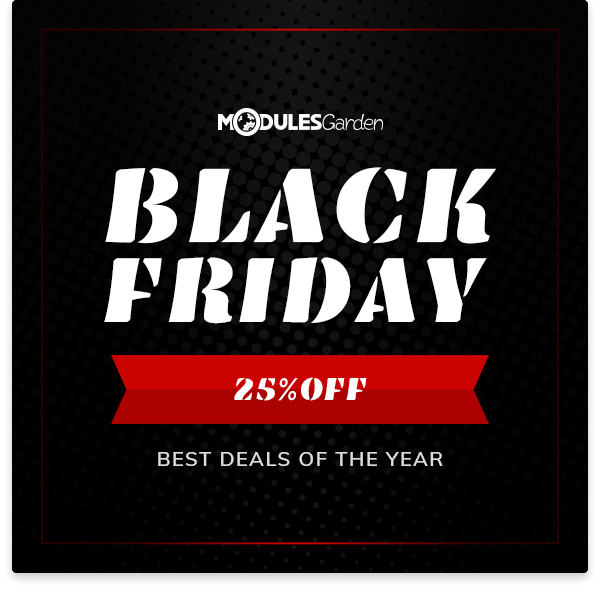 The rules are extremely simple: once the Black Friday bargain is over, so is the promotion for annual licenses, giving way to the absolutely one-of-a-kind Cyber Monday offer devoted exclusively to the unencrypted software. Go for the deal that suits your business best!